1.Some insects molt more than 50 times, shedding their exoskeletons as they grow. 2.Some small Files flap there wings 1000 times a second. 3.A single egg laid by some species of wasps may produce up to 1000 new wasps. 4.A grasshopper can travel a distance 15 times its body length in one leap. 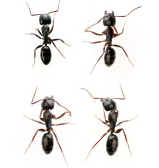 5.Many insects smell with their antennae, and some taste with their feet.